Most women have to agree that having a pair of heels does wonders for us. Not only does it accentuates our curves, but it also gives the self confidence that is unfathomable. However, one of the biggest fears ladies have is that it is incredibly difficult to find a comfortable pair of heels. A pair of bad heels can often be painful or even give us blisters but no pain, no gain, right? No – GENA SG has come up with a brilliant solution to help you with all your heel horror stories. GENA is a startup footwear company that specializes in adjustable-height heels. Their flagship heels are every bit a stylish pair of footwear. 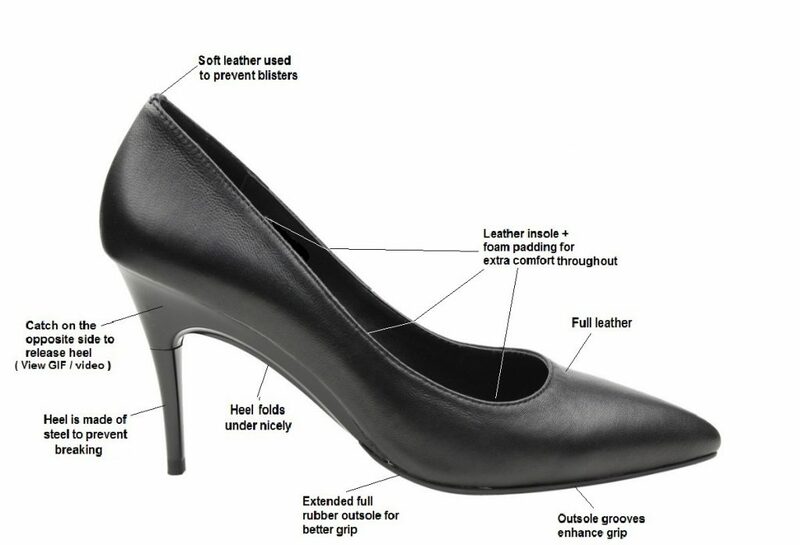 However, unlike conventional heels, they bring convenience, flexibility and practicality to the everyday woman. GENA is made up of individuals striving to make wearing heels a much more comfortable experience. They are all familiar with the struggles women go through when wearing heels, be it as wearers of heels ourselves or as significant others of those who do. Their heels are specially designed to be easily adjustable anytime, anywhere. Flicking from high to low can be done in a matter of seconds, giving your feet a break whenever needed. Press on a small non-protruding button located on the side of the outsole. Pull the heel downwards to detach. Tuck the heel under the outsole. There will be a click indicating that it is secured. They will be releasing further designs in future (as soon as Christmas 2017) so stay tuned! The idea came to the founder when she was a fifteen years old on a night out with my family. She witnessed a group of girls walking barefoot, swinging their heels’ ankle straps at their fingertips with defeated looks on their faces. However, it was only a few years later (around 2014), after countless personal experiences and comments from friends and family that pushed her into doing more research. After 2 years of research and development, she found a manufacturer willing to work with us in producing such an unconventional product – which was a great challenge. Women should not have to suffer simply to look and feel amazing! For years, working women have often been seen lugging an extra bag to the office just for another pair of shoes, switching from flats to heels and vice versa, and women on their nights out on the town have been seen walking around barefoot after a night of partying. With these heels, all of this would become a distant memory. They have the answer – the adjustable-height heels. Being able to share the modern design with every woman and making their lives that much easier is what they want to achieve, and is what drives them. They strongly believe that this product is something women of all ages have been waiting for, and want ladies to know that the wait is over.